A 25-year-old Ukrainian man has been charged with the "terrorist-related" murder of Birmingham grandfather Mohammed Saleem, police say. 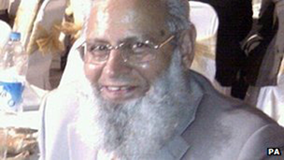 Mr Saleem, 82, was stabbed as he walked home after prayers from a mosque in Green Lane, Small Heath, in April. Pavlo Lapshyn, a student from Dnipropetrovsk, is due to appear at Westminster Magistrates' Court on Tuesday. He was arrested following two explosions near West Midlands mosques. The 25-year-old is still being questioned by detectives investigating the blasts near the mosques in Walsall and Tipton, and a third in Wolverhampton, between 22 June and 12 July. Mr Lapshyn, who has been in the UK on a temporary work placement since 24 April, was initially arrested on Thursday and arrested again on suspicion of the murder of Mr Saleem on Saturday.